"And now you know the REST of the story!" After I published my last blog post, a couple of people asked about the mechanics of the piece. 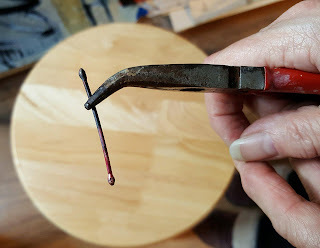 It struck me that if I was calling it "process jewelry" I should show you the process. So here goes. 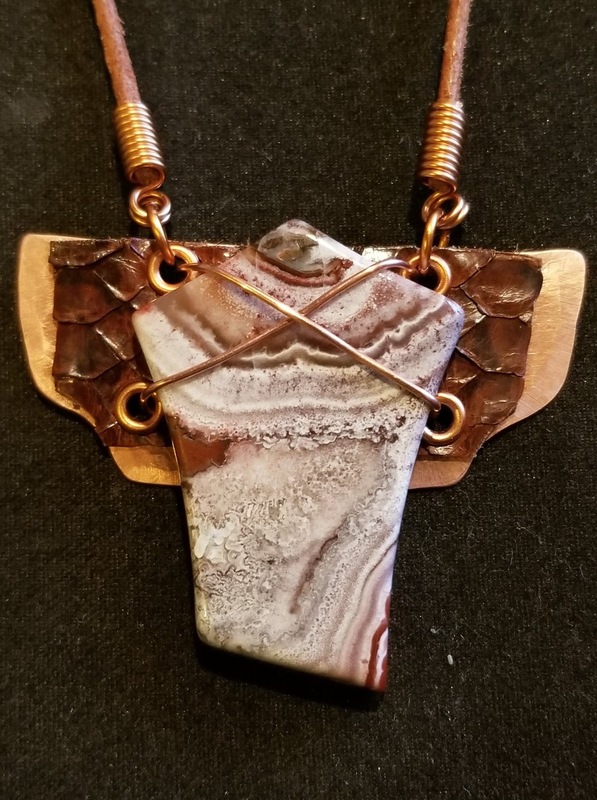 First, I must tell you that Vickie has several decades of experience making jewelry from polymer clay and her work is spectacular (we have some beautiful examples in our store). Moreover, she is known for her exceptional finishing- the added care that makes her pieces rise above the rest. Second, our philosophy, especially when working with copper, is to make every piece we can. So here is the back of the piece. As you can see, there are marks visible on the back of the copper plate. We could remove these but choose not to. These are the artist's marks and we feel that they should be left to show the "process". Here, you can also see the backs of the hand hammered eyelets and how the fastening copper wire is joined. Care is taken to tuck the ends to ensure there are no loose ends to catch on skin or clothing and, if necessary we smooth the ends by using a file or sanding using 600 grit paper. Also, you will note that the connectors (jump rings) are hand made from copper wire. A rod is attached to a power drill and the wire is connected to the end of the rod and then wrapped using the rotation of the drill. WARNING! If you do this, be sure to use leather gloves to hold the wire as it can cut you if it gets loose. Then, a jeweler's saw is used to saw individual rings. (As the lowly apprentice, this is my job). The coils used to hold the cord are made in much the same way with sections, rather than individual rings, being cut to the desired length. The top end is pinched to secure the cord and the bottom end is opened up to accept the jump ring. Finally, the cord is cut to the desired length and a clasp is added. Both sides of the clasp are hand made from hammered copper wire. It is important to flatten the paddle on the open piece so it can slide easily into ring on the left of the photo. So the process starts with the shaping and finishing of the stone. Vickie decides on the shape and I do the execution. Then, Vickie comes up with a concept for the setting and we are both involved in the execution with her deciding shapes and me making all the copper findings. The end result is a piece that is not only sturdy and beautiful in a somewhat primitive way, but also very interesting. 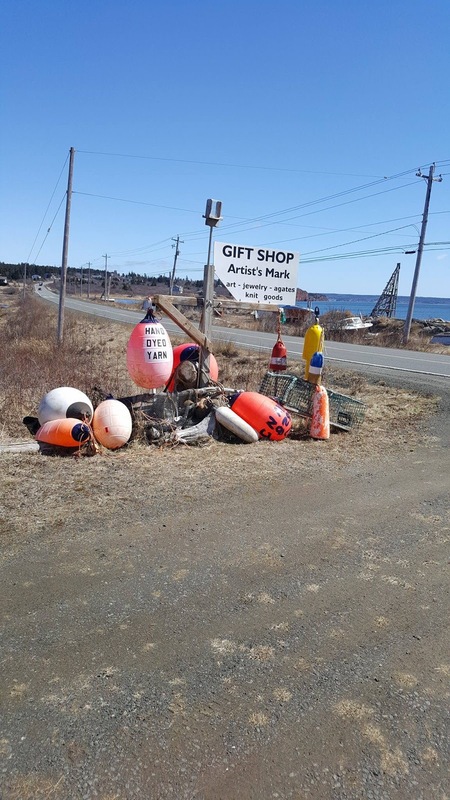 We hope you are having an enjoyable holiday season and look forward to seeing you at the Artist's Mark Shop in the New Year. 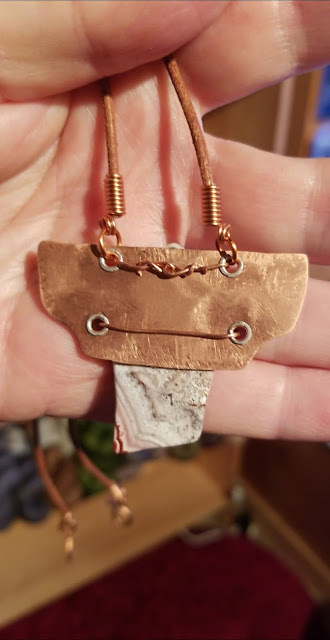 There are some exciting changes that I will be detailing in upcoming posts as well as more examples of our process jewelry so come back and check from time to time.. 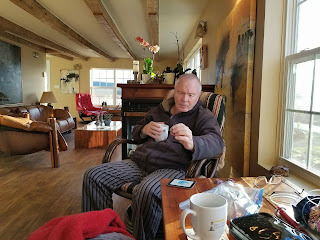 Sorry for the gap in posting but both Vickie and I have been fighting problems with our sciatic nerve and just now getting back to what passes for normal around here. As some might know, my wife, Vickie, is an accomplished "Process Painter"- someone focused more on the creative process than the outcome. 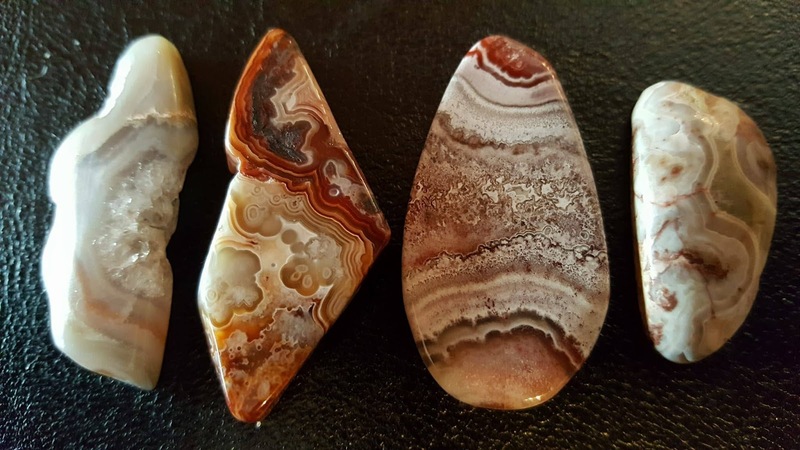 For some time we have toyed with the idea of bringing this idea to our stone jewelry, meaning that while we hoped to showcase and enhance the beauty of the stone, our focus would be more on the creative process involved. We finished our first piece yesterday and here it is. 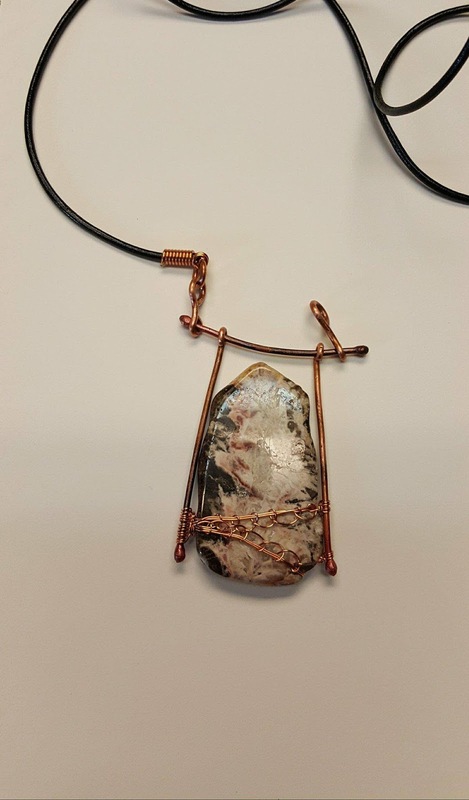 The stone is a piece of Brazilian crazy lace jasper and it is secured by copper wire to a copper back plate covered with a piece of snake skin Vickie found in her "stash". Pretty well all of this is hand made. 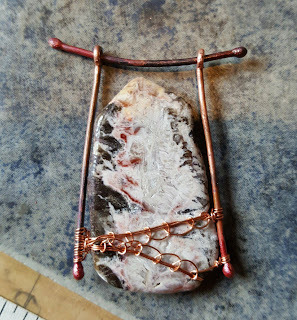 The stone was finished by hand as was the copper plate. 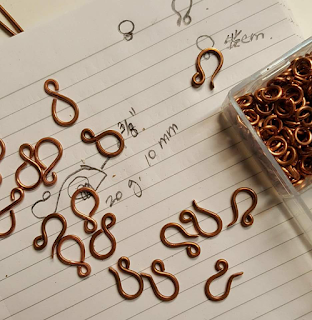 All connectors and eyelets were hand made from copper. 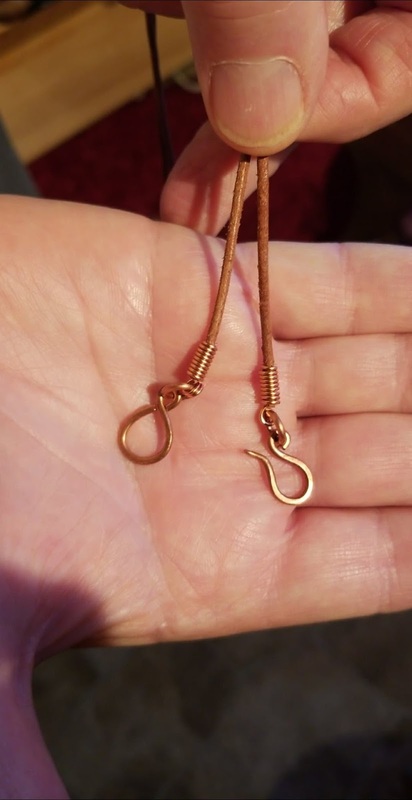 The cord is leather and it is about 4.5 cm. high. We felt it looked somewhat like a bird so we called it Rufous after the State Bird of Brazil which has a similar colouring. Our objective is to create jewelry that, while being beautiful, is also interesting and we hope to have a few dozen pieces in the store by the spring. I have to confess that we had a ball working out the logistics and it doesn't hurt that Vickie appears to have one of everything! So let us know how we did and if you get the chance, stop by to see it in person as I can honestly say that the photo doesn't really do it justice. As mentioned yesterday, the current weather on The Neck is perfect for working in the VT Rock Lab. And overnight, it got even better (worse?). Today, we are experiencing the perfect trifecta- monsoon rains, 50 mph winds from the south and king tides. Here are some of the results (I apologize in advance for the quality of the pics. I'm much better with rock). 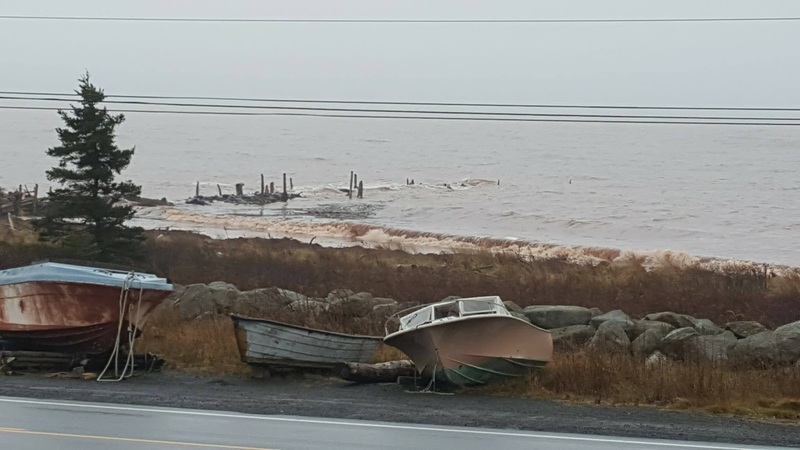 This is the pier across the street- pretty much totally submerged and it isn't even max high tide yet! You also get to see a portion of the "boat graveyard" that seems to fascinate tourists of all ages. Normally, we have a small marsh just to the east of our property but today, it's a regular Lake Okeechobee- swollen to several times normal! Honestly, I've never seen the marsh this large- probably because of the combination of tides and wind direction. But there has been a third result. The piece in the center is local but the other two are "imports". The depth in the patterning is truly amazing and someone is going to really treasure one of these if I can pry them from Vickie's tenacious grasp! With the look of things outside, I'll probably have a few more to show tomorrow. With the shifting seasons, things change on The Neck. We are currently getting King Tides because of the Supermoon and the pier across the street is totally under water at the highest point. 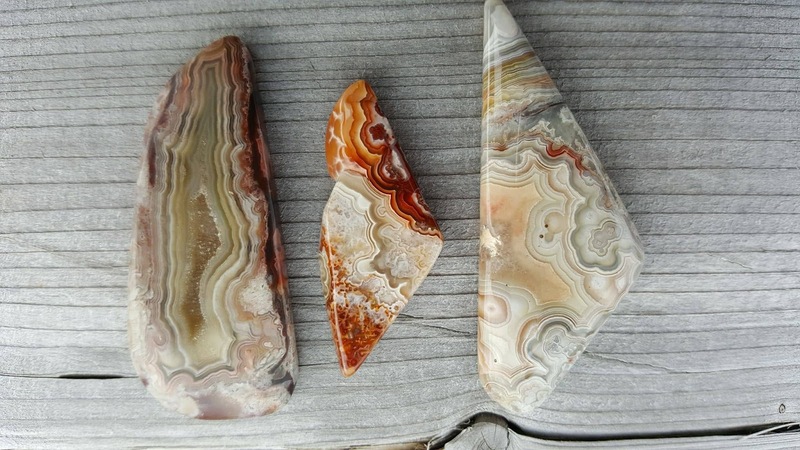 The weather has been cold and grey- perfect for doing lapidary! Here are a few stones I have worked on over the last few days. 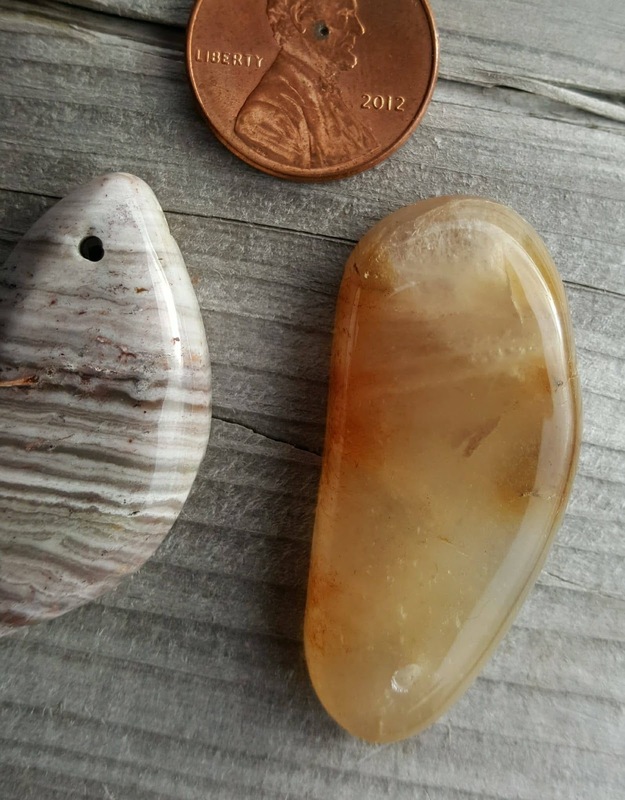 The piece on the left is a beautiful bit of banded jasper (found right here on The Neck) with a little bit of glitter- amethyst crystals- at the centre right. The two in the middle are from my stash of crazy lace "jagate" from either Brazil or Mexico. 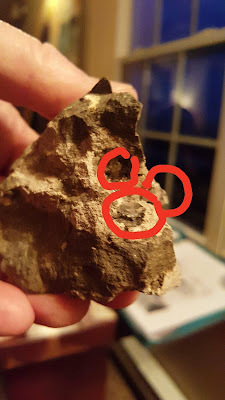 And the one on the right, which, unfortunately is a little out of focus, is a beautiful botryoidal jasper from here on The Neck. I'm getting an even better polish now that daughter Sandra has given me a Norwex cloth used to cleaning glass. If you know someone who sells Norwex and you want to get a superior polish on your stones, try to get your hands on one of these cloths! These pieces are so smooth it is literally almost impossible to hold them without them slipping out of your grasp. In the days ahead, these will become unique pieces of jewelry that will definitely be available in the shop and might even be selling on line in the new year. 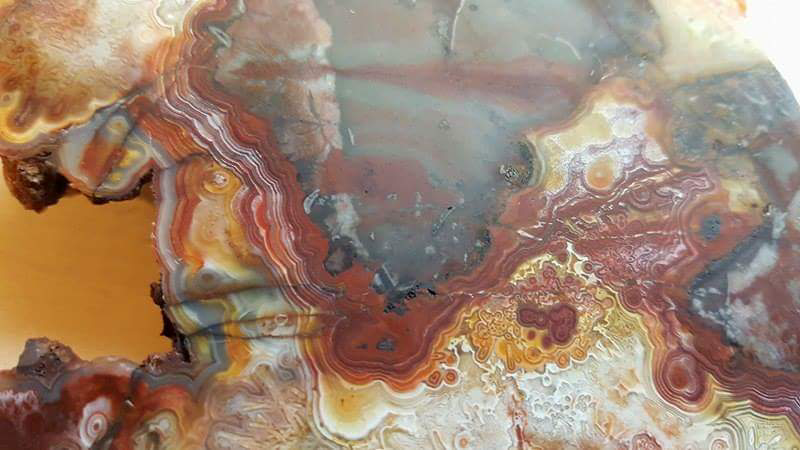 So the lapidary machines are humming in the rock lab and I'll be posting more beauties in the days ahead. Above is a nice piece of (very hard) plume agate that I have managed to polish to a glass like finish. 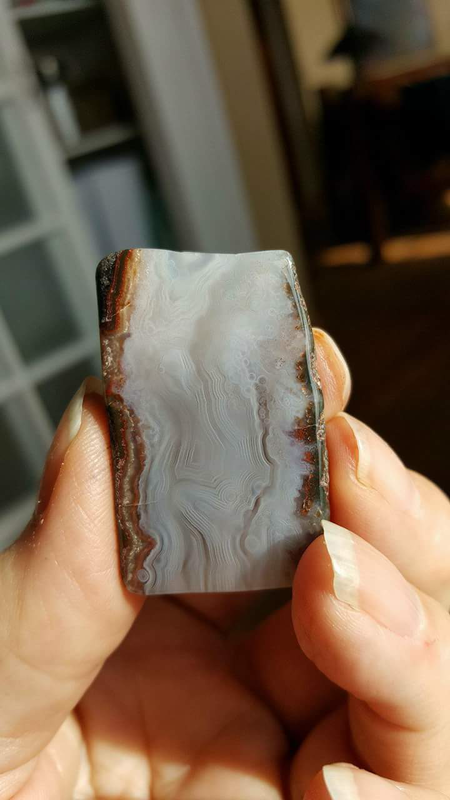 A gorgeous piece of vein fortification agate which I have also been able to polish to a glass- like finish. It is much more spectacular in person. 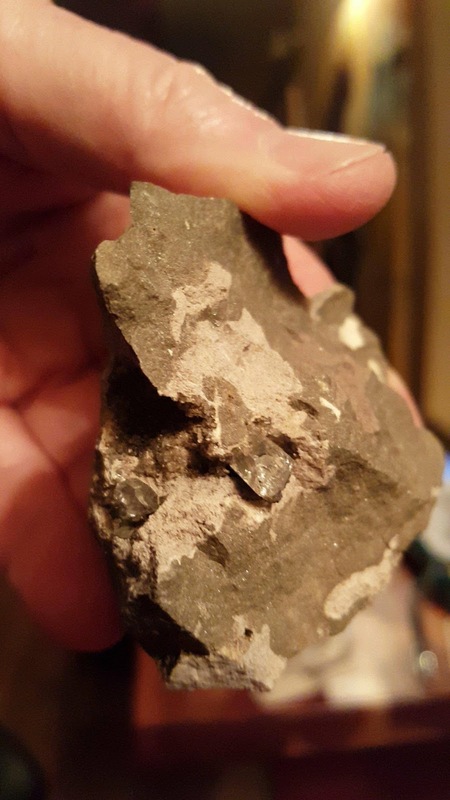 Also, I got my new supply of diamond bits and have been perfecting my drilling technique.While it is still a little (maybe more than a little) rough and I will cop to a couple of broken bits, here are a couple of local stones ready to become pendants. 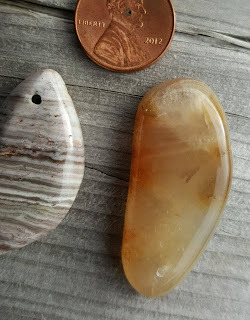 I think it is banded jasper on the left and a pretty cool moss agate on the right.They are drilled slightly off centre to get the spot where they will hang perfectly vertically. Recently, I came into possession of a beautiful piece of crazy lace from "out of town". I can't really say if it comes from Brazil or Mexico but it is beautiful stuff and takes a great polish. 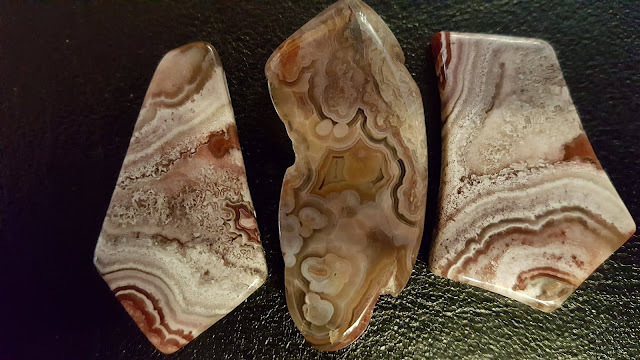 Some people call this jasper and some call it agate but either way I just love the patterning in these stones and especially the druzy in the one on the left but I have a real problem. When they look this amazing on the back, I don't want to cover them up with a silver backing. Any suggestions? One way or another, all these guys will be in the shop shortly so if you are looking for a truly unique gift or just want to see some amazing rock, come on by! At this time of the year, it is best to call or email to ensure we are open. So after a one day delay due to high winds, Dump Day has finally arrived! I would advise some of my friends, (you know who you are Cal and Ted!) to read that again- carefully. It is not "Take a Dump Day"! Dump Day marks the official, legal opening of the lobster season here on Digby Neck. 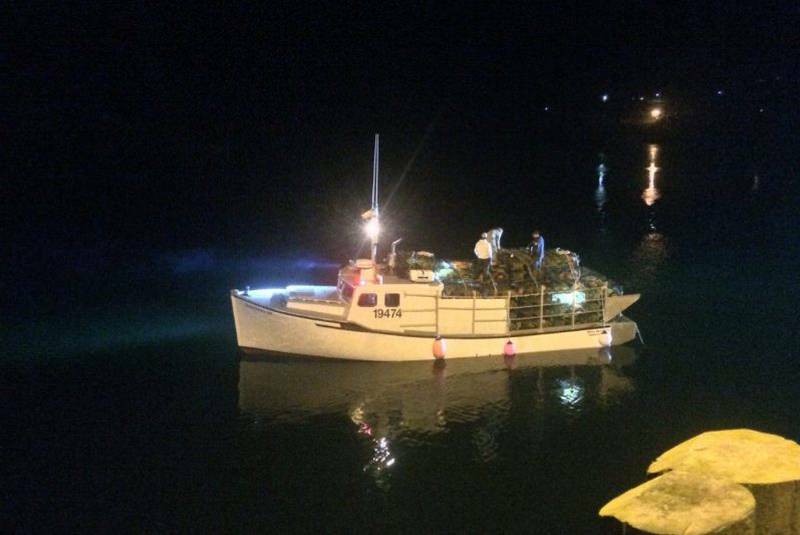 The lobster traps have been loaded and on board for several days but at midnight Tuesday (morning), the boats were able to leave port. The ship above seems to be listing a bit under its heavy load of traps. 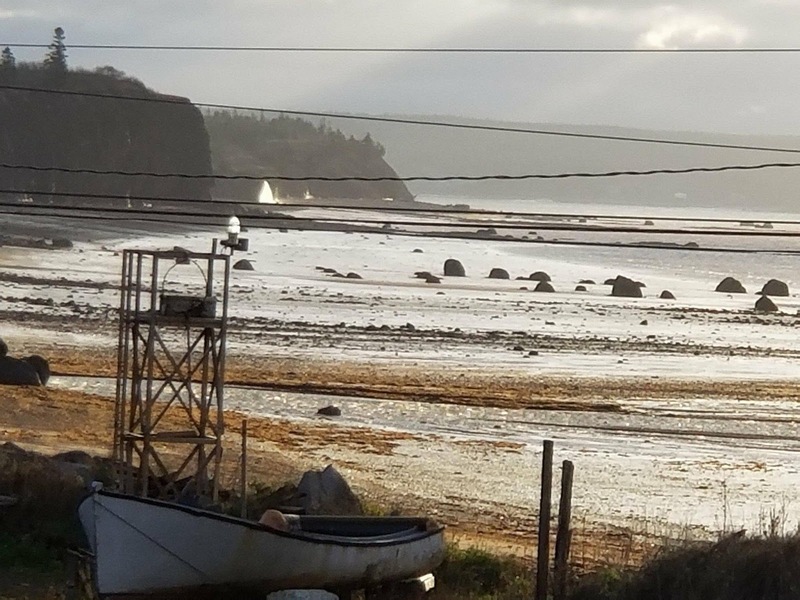 At just past midnight, there is a string of ships leaving Sandy Cove (these pics are from last year) and head out to the lobster grounds. 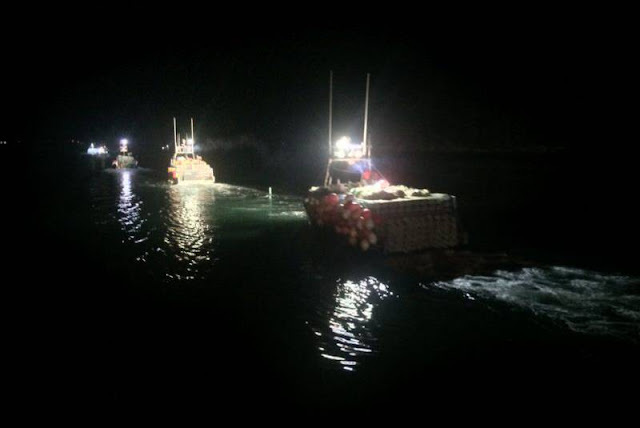 There, the ships will do the initial "Dump" of their traps or pots as they are sometimes called, all baited and waiting for the lobster to step inside. 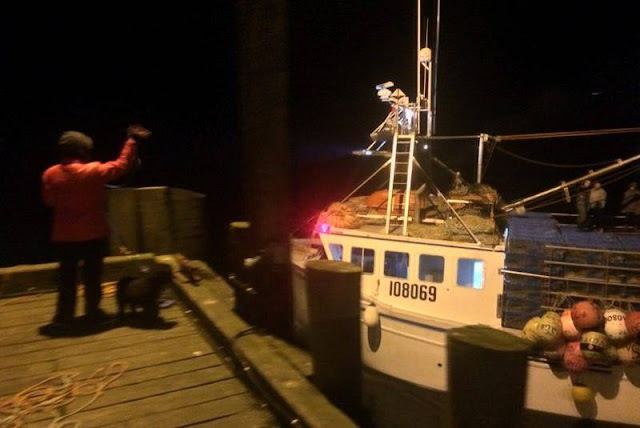 This is a very important day locally as lobster fishing is a big part of our economy. And even with all the latest advances in hydraulics, navigation and safety, it is still a hard and dangerous job so the next time you are enjoying a lobster meal (after complaining about the cost), think of these fishermen, doing what lobstermen (and women) have done for untold centuries, heading out to the unknown to bring the bounty of the sea back to us on shore. 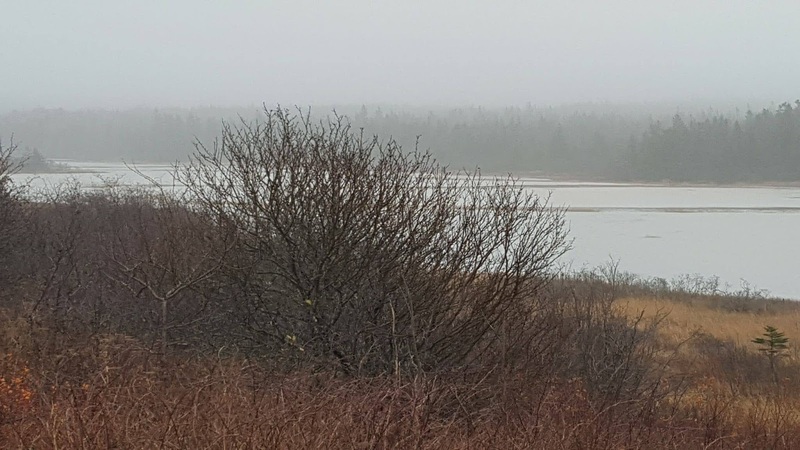 So next summer, why not make plans to visit Digby Neck, a spectacularly beautiful, interesting and totally unique part of Nova Scotia. You won't be disappointed. And when you do, come and visit us here at The Artist's Mark Studio/ Shop. 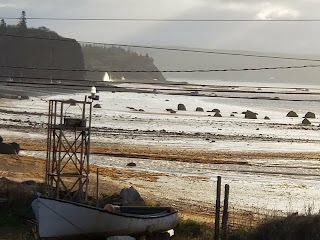 You will be able to see our inventory of world famous Seawall Fibres Hand Dyed Yarn and watch as spectacular local agates, jasper and amethyst are turned into beautiful jewelry in our lapidary shop. If you have kids, they will really enjoy it and even get to take home a free "piece of The Neck". There isn't a day goes by when I don't give thanks to my creator for the beauty that surrounds me. Digby Neck is truly a unique, fascinating and beautiful place to live. 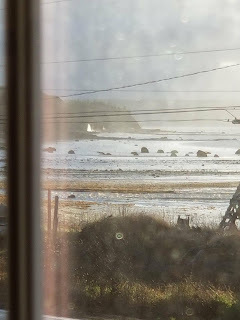 And just as the tides change the landscape every time you look out the window, so does the angle of the sun. It is much lower down now so it almost acts like a spotlight at times. 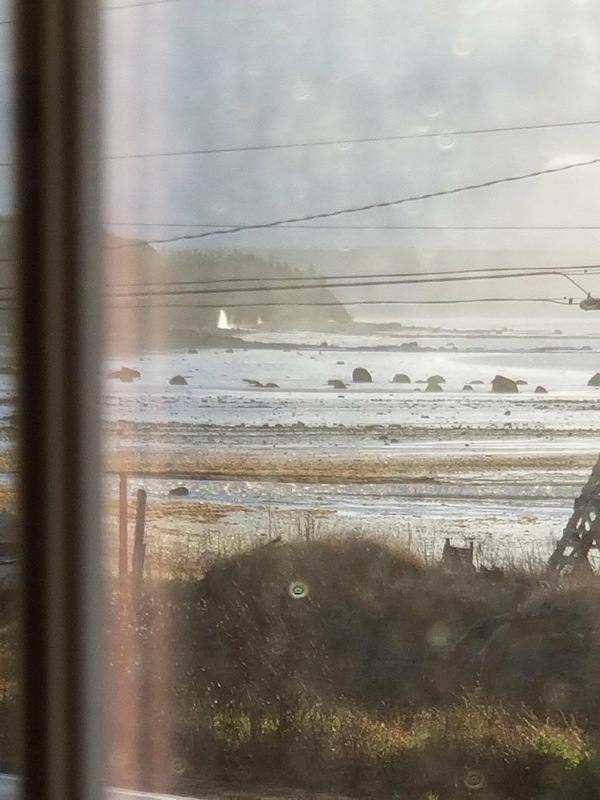 Here is what we saw through our window as we had coffee this morning. Just to the left of centre you can see the sun highlighting one of the waterfalls in the red sandstone cliffs. These waterfalls pop up every time we get a lot of rain. 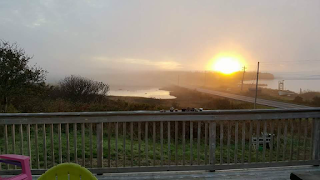 It was so amazing that it prompted Vickie to take her new Samsung Note 8 phone and take a few more from the deck. and how to get the last bit of goodness out of this beautiful piece of jasper from Brazil. It is a busy time of the year here. 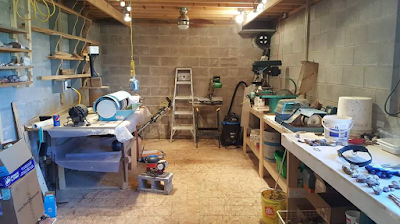 Lisa and Vickie are gearing up for the Black Friday yarn sale that starts at midnight tonight and since my large saw has been repaired, I can go back to cutting slabs. The snow tires are on the car so we are all set for the winter snows that must surely come. 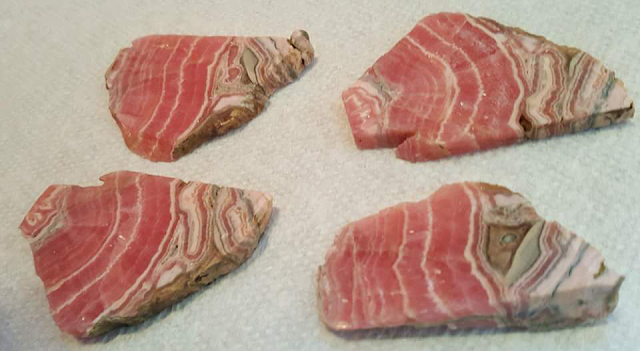 The Rhodochrosite Has Been Cut! 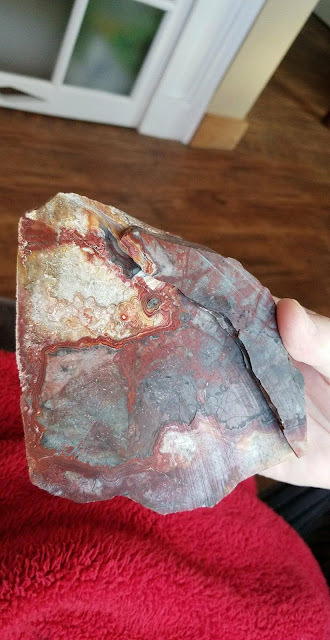 In my last post I showed a chunk of rough rhodochrosite that I picked up Monday. Yesterday, I mounted it to a piece of 2x4 so I could cut it and after letting it set overnight I was able to put it on the saw this morning. Here is the result. Even before it has been polished you can see the vitreous lustre (no that's not a typo- that's how we spell it here in Canada). 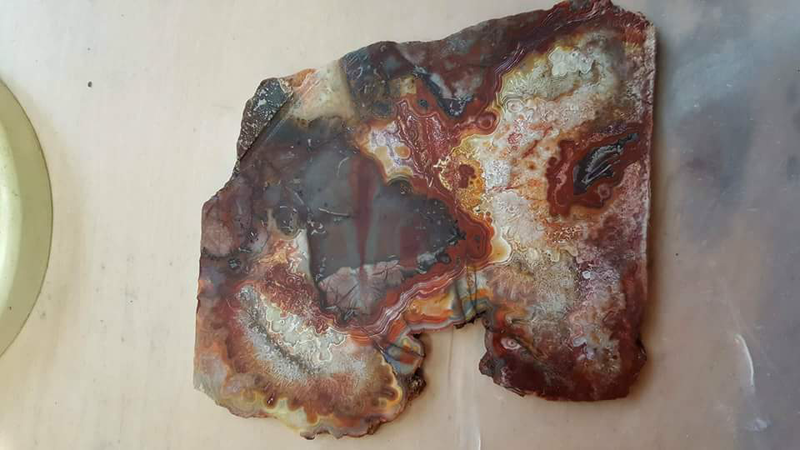 I had to cut the slabs a little thicker because the stone is quite a bit softer than the agate I normally work with. 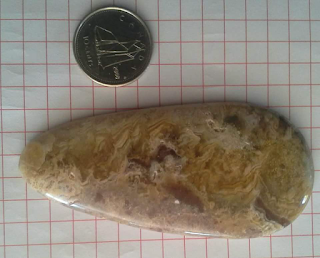 Agate has a hardness of 6.5-7 while this is 3.5-4, close to calcite and flourite. What really stands out, apart from the lustre, is the beautiful linear design which is a product of how and where the stone was formed. Rhodochrosite is often found in veins associated with silver and I'm pretty sure this piece came from a silver mine in Argentina but the circular patterns are because this rock actually formed as a cave piller (stalactite or stalagmite) one drop at a time! Rhodochrosite is sometimes called Inca Rose and is, in fact, the national gemstone of Argentina. It is sometimes referred to as the "Stone of the Compassionate Heart" which is probably why I identify with it so much, me being such a compassionate individual and all, (heh,heh). Maybe it will inspire Lisa to introduce a new colour of hand dyed yarn through Seawall Fibres (yes, that's how we spell fibre in Canada). The stone in the lower right is a thin end piece and it will be cut about in half and shaped as per the instructions of "She Who MUST Be Obeyed. The other three pieces will be turned over to her as well and she will decide how she wants them cut and shaped. I can tell you this- we're going to get some beautiful pieces in the end and I'll try to post follow up pics as they become available. In about a month, on December 11th of this year, we will have been married for 47 years. This, of course, is solely due to Vickie's Job like patience and my learning when to keep my big mouth shut! When we got married, money was really tight. Some will say that with me, money is always tight but that's the subject of another blog. Anyway, Norwegians get married by exchanging gold bands and when I saw that Hemsley's Jewelers in Montreal was having a sale on gold bands I took it as a sign of two things- one, I was really Norwegian and two it was time to propose. Catching Vickie in a weak moment she said yes and I have been on a series of one year contracts ever since- sort of like Walter Alston when he was managing the Brooklyn Dodgers. To get some leverage and ensure that contract negotiations go smoothly, I thought it was time for Vickie to finally get her diamond. 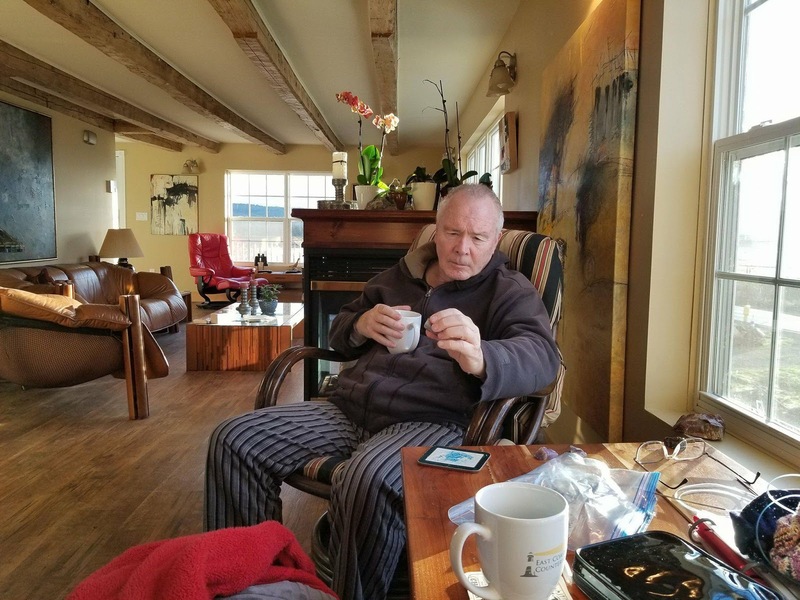 So earlier this week we paid Vaughn Tidd a visit over in Barrington and we came back with her diamond. It is actually a Herkimer Diamond- a biconed quartz crystal from Herkimer NY and upon closer inspection I realized I actually bought her three! Can't believe I'm getting so generous! She's gonna have to strengthen her wrist a bit before she can wear it but it will sure be a show-stopper! 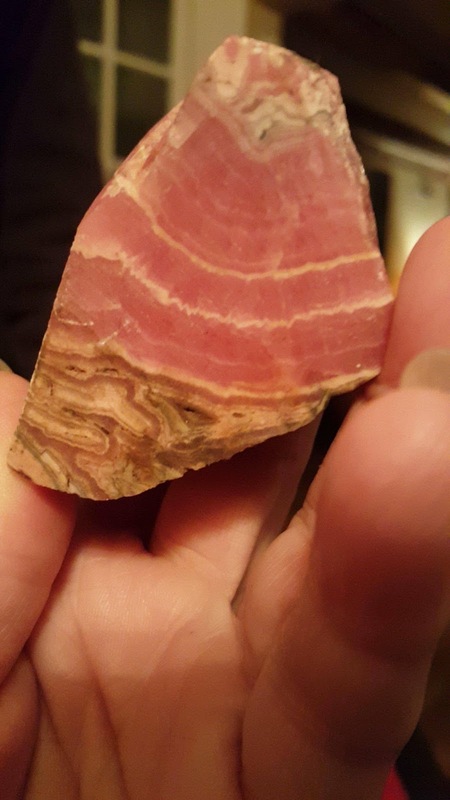 Anyway, to seal the deal, I also bought her this beautiful piece of rhodochrosite which I will cut so she can make herself (and possibly a few other people) something pretty. I am pretty sure this comes from an old silver mine in Argentina because that's where this mineral is found forming stalactites and stalagmites- hence the rings. If you are on The Neck, stop by and say hi if I have the "open" sign up- even if I have taken the big sign down. Well, the weather is definitely changing. 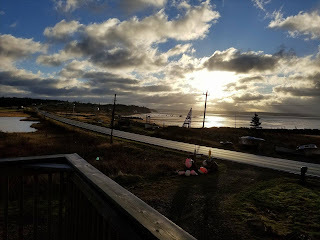 Have had the wood stove going for about a week but although we had a bit of sleet a few days ago, so far no snow. These are the perfect climactic conditions to make jewelry... indoors... in a cozy studio. I have also become proficient at cutting the "jump rings" shown in the upper right corner. All of this is so that my "sensei" can do her thing. She also had a few things to make first (since I am not allowed to control anything that is on fire) so here she is making some copper pins using a blow torch. Vickie and I both prefer interesting stones such as agate over classic gems and we both feel that any setting should add interest to the stone and not overpower it so in this case, since we started with a fairly large piece, a little bit of copper was only going to make it better. Vickie started to work her wire magic. The rock, by the way, is local and appears to be a vein of stilbite that has subsequently replaced by agate, framed in basalt. Never seen anything like it and probably won't again. She felt that Greek leather would be the perfect "chain" for it and now we are just waiting for the new owner to tell us how long she wants it. In the days to come, I'll be posting pics of what comes next so keep checking 'cause you will see some really interesting stuff. 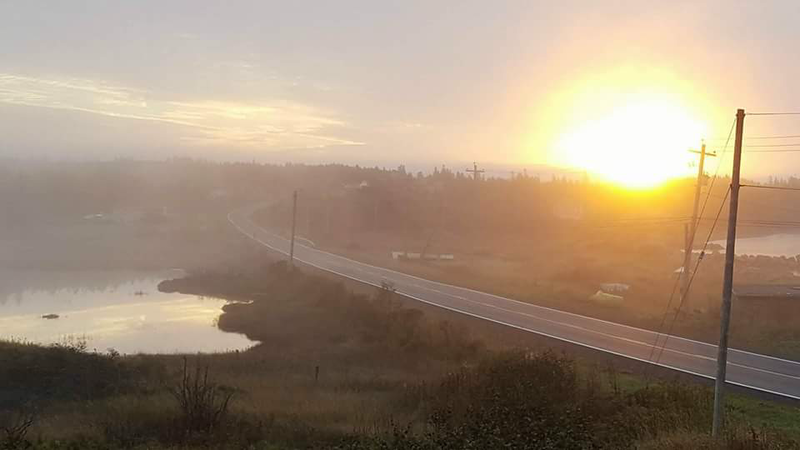 So after a long stretch of beautiful weather, we had a real doozy hit last night and it will get progressively worse through the day today with wind gusts hitting 110 KPH. So instead of rockhounding yesterday, I spent the day preparing- including the removal of our large sign in the front by the road. In that big a wind coming from the south, the sign might end up in New Brunswick! I will probably leave the sign down until the spring but will still change the smaller Open/ Closed one so if you see Open, come on in! We just got a new large shipment of yarn and I have completed about 30 pieces of inexpensive pendants. Got the flat lap wheels I was missing so it is back to work today! Even though the weather is still beautiful (ignore that big storm heading right at us), the tourist season is dying down and we have more time to work on some of the beautiful raw materials in the rock lab. Today, I got the last full load of raw stones out of my Lot-O-Tumbler and it didn't disappoint. Some of the larger pieces will get special treatment. 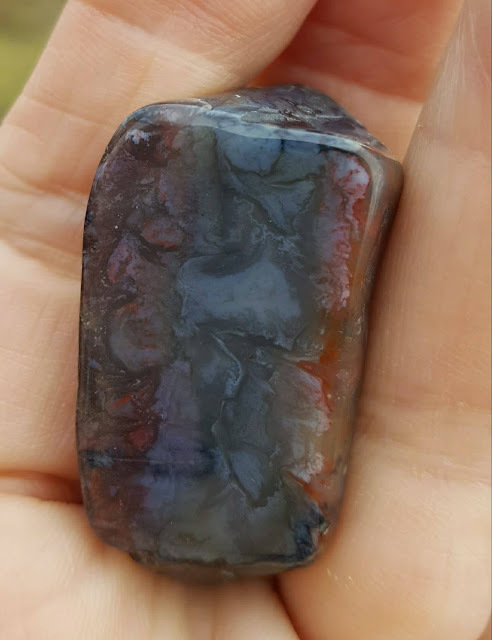 Who wouldn't want to wear a pendant made from this? And Vickie has already started on some exceptional stones. 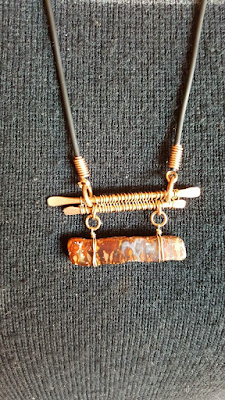 Here is a piece of crazy lace agate from Gulliver's Cove finished with a copper prong setting. Here is another that shows what can happen when you marry a beautiful stone with Vickie's amazing wire work. 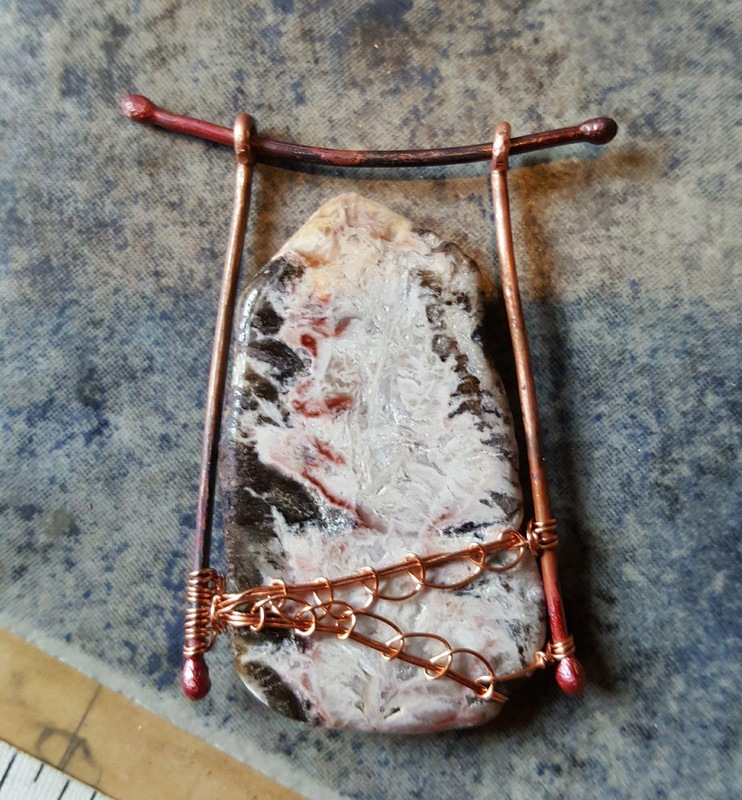 The piece above is entirely hand made from copper wire and a great piece of golden plume agate and even more spectacular in person. 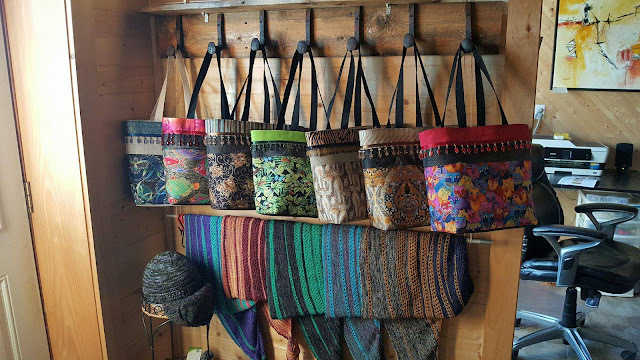 By next spring, it is our goal to have 50-75 pieces in all price ranges in the shop and available on line so keep checking the blog to see what we come up with. Also, over the winter, we will be revamping the shop a little and I'll post pics. We have already improved the lighting so stay tuned. The price is still the same- $45 and, as you can see, they are works of art. So if you are looking for that special gift for that special person (ie. YOU! ), stop by the shop and pick one up before they are all gone because it may be a very long time before I can get the "Bag Lady" to haul out her sewing machine! If you are not from this area and would like one of these bags, we can ship it to you and you can pay via paypal. Just send me an email or comment on this post. I will try to post some pics of other items we have that you might want to purchase on line. 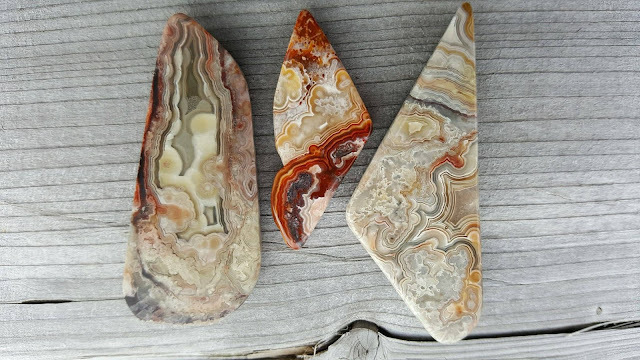 Today, we start in earnest to make jewelry from our beautiful stone. I will be working as Vickie's no-pay apprentice so if the blog suddenly goes dead it will be because I have suddenly gone dead. Cheers and it's been nice knowing ya! We Have a Rolling Mill! Apparently, I have been living my life in blissful ignorance, unaware of the huge void that existed. That has been rectified, however, as we now have a rolling mill! "What the heck is a rolling mill", I hear you ask. Well, basically a rolling mill is something you can roll metal through. "And, more importantly, why do YOU feel the need for one?! ", I also hear you ask. As many of you know, we make jewelry from the beautiful jasper and agate we find locally. Actually, I misspeak. 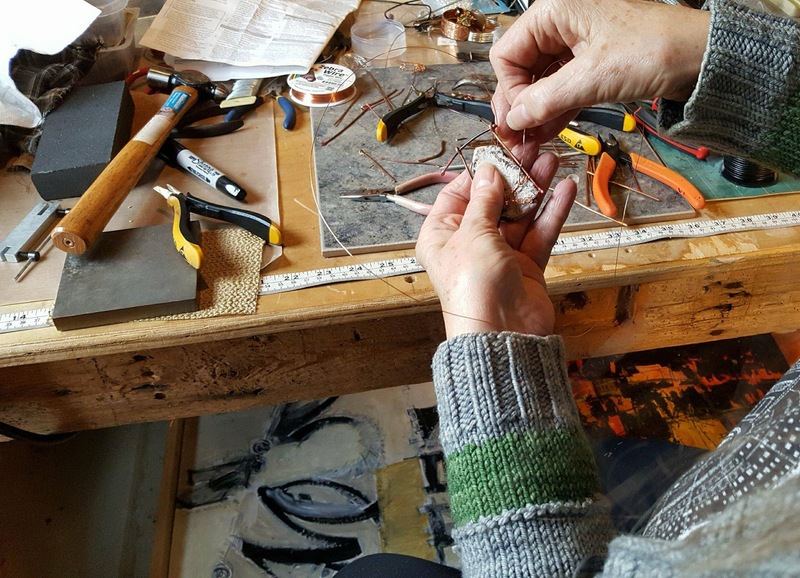 Vickie makes the jewelry in her magical studio next to the shop using copper, silver and other metals to create settings for the stones. For some time, she has been telling me she could really use a rolling mill. Now rolling mills come in all sizes from hand turned bench models to those huge machines used in factories. But even the smallest examples are not cheap! Try looking for one on EBay and you will see that you are looking at several hundred dollars, possibly even thousands for a more automated version. Recently, we were visiting John and Nancy Hood in Yarmouth. 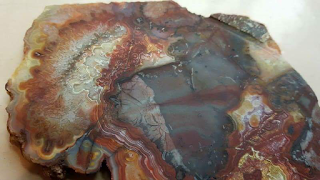 John does beautiful lapidary and creates stunning settings and all our really high end pieces come from him. He and Vickie are similar in several ways- they never throw anything away and they have at least one of everything in their "lairs". 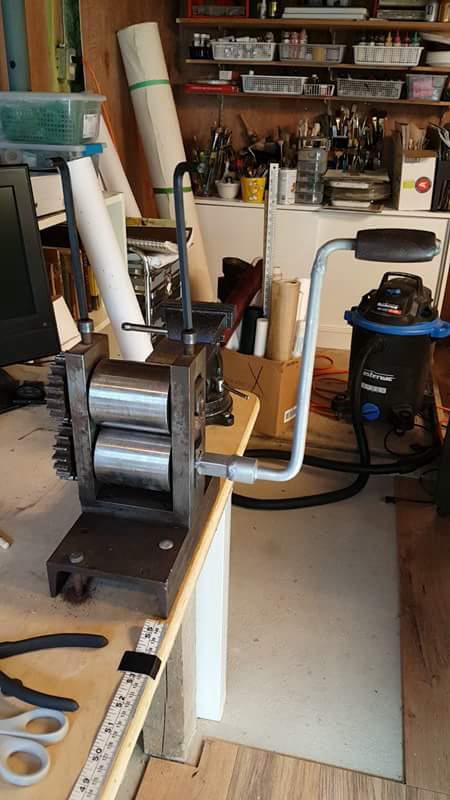 So when I mentioned that I was in the market for a rolling mill, it didn't take me by total surprise when John said he might be able to help. A few minutes later he was back with "The Beast" and a deal was made. At that point I had a rolling mill that couldn't roll. It had no handle and the cogs were not being held in place. Fortunately, I have a friend who does welding and he attached the handle from a hand auger and secured the cogs. There was, however an important piece missing. On the top, there are two screws that you use to raise or lower the heavy rollers. Naturally, you want them to be positioned so that the space between the rollers is consistent and so ideally, you want to move them both the same amount for each pass. To do this requires a little effort so each screw has a slot in the top for a 5/16 inch Allen Wrench. Do you have any idea how much these wrenches cost? The best deal I could find was going to cost me around $20 but then a very rare thing happened. Do you ever go to Canadian Tire or any store and see that they have an unbelievable price on something that you either don't need or just bought? Sometimes the price is so good that you wish you needed one just so you could buy it. 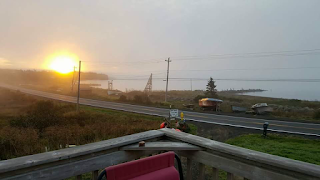 Well, on the CT web site they showed that a set of Allen wrenches, including the one I needed, was reduced from $17.95 to $4.95 and better yet, there were two in Digby! So for $10 plus tax (paid entirely with my $ millions of accrued Canadian Tire money) we were in business. I give you "The Beast"! As you can see, I have bolted it to the bench ( a bit of overkill in light of how much this thing weighs- I estimate about 50 pounds at least. 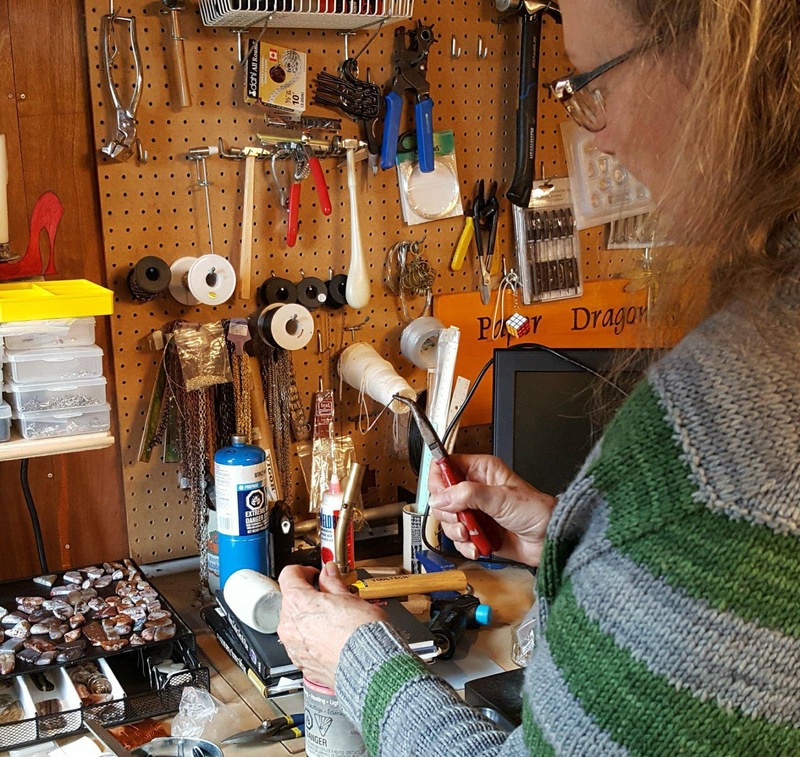 The two "ears" sticking up are the Allen Wrenches and as you can also see, Vickie's studio is, as it always is- a mess! 2. Making metal sheets thinner. 5. Acquiring a hernia carrying it from the car to the studio. This thing is definitely going to change my life! In the upcoming months, I will be posting pics of some of the pieces that my jewelress is going to create so stay tuned! A neighbour just left yesterday to return to his winter home and it was as if the weather was mocking him. 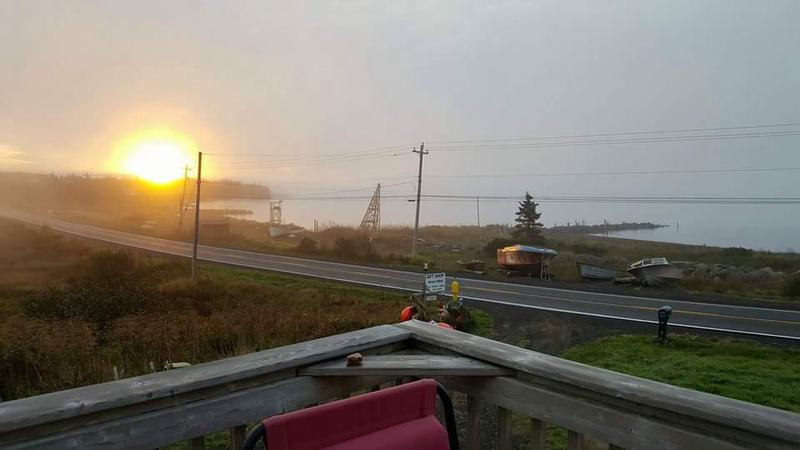 As with every fall, we are having a run of spectacular weather- sunny, mild and little wind with morning fog. Pretty spectacular, huh? Especially since if you looked up, you could see the moon perfectly. So if you are planning a vacation next year and thinking of coming this way, consider the fall. Pretty well everything I sell in the shop, actually pretty well everything I work on, comes from within a few miles of my house. 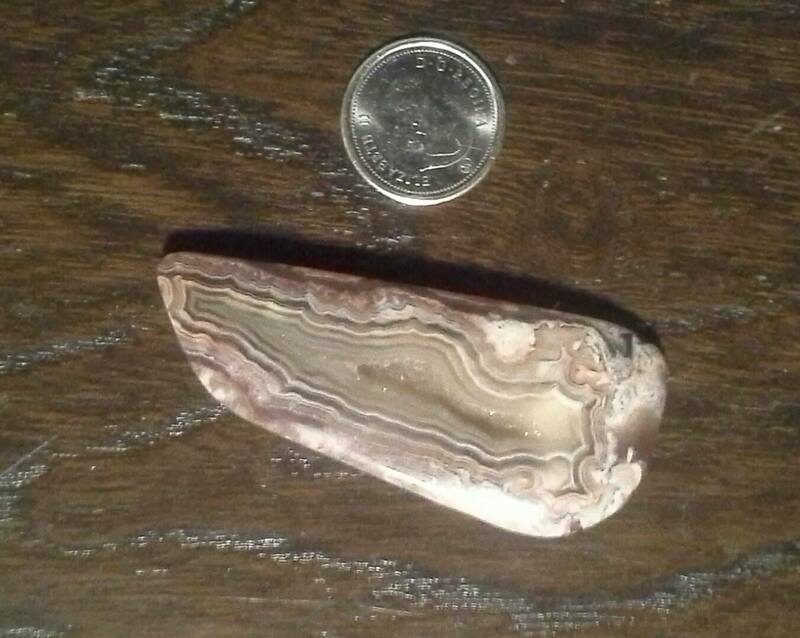 But recently, I came into possession of a really nice piece of Brazilian Crazy Lace Agate. This stuff is absolutely amazing in both its colouring and pattern. 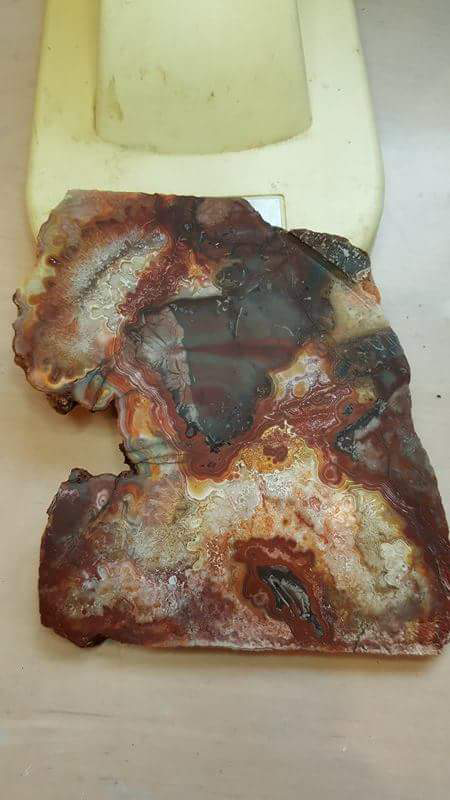 I had one slab and gave the rest to John Hood to cut on his larger saw and I was not disappointed because here are some pics of what I got back. These slabs are about 6 inches by 8 inches so there is a lot of beautiful stone to work with. And, since I got my missing flat lap discs in the mail yesterday, I was able to put the machine through its paces. 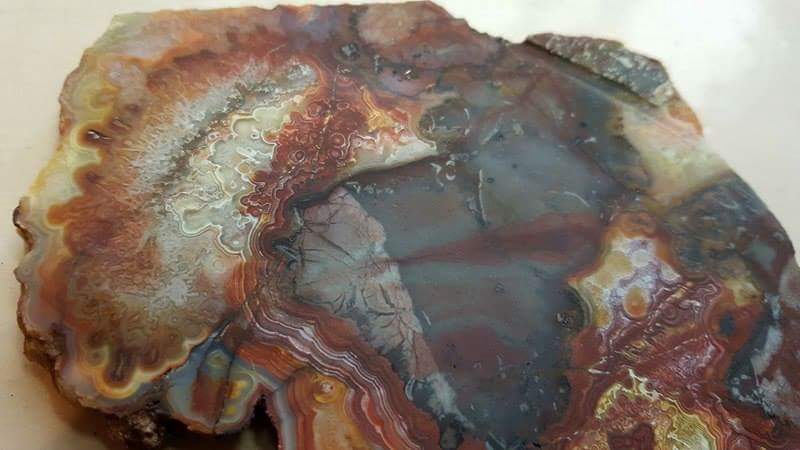 I was very impressed by what it could do and my home made drip system worked perfectly.I was able to work a piece the same as above but with a druzy in the center that made it iffy to get marks out near the middle. The flat lap worked beautifully and here is a piece worked to 3000 grit on the flat lap and then finished at 8000 on my arbor. Because of my total lack of photography skills, the colours aren't great but as you can see, the scratches are gone! 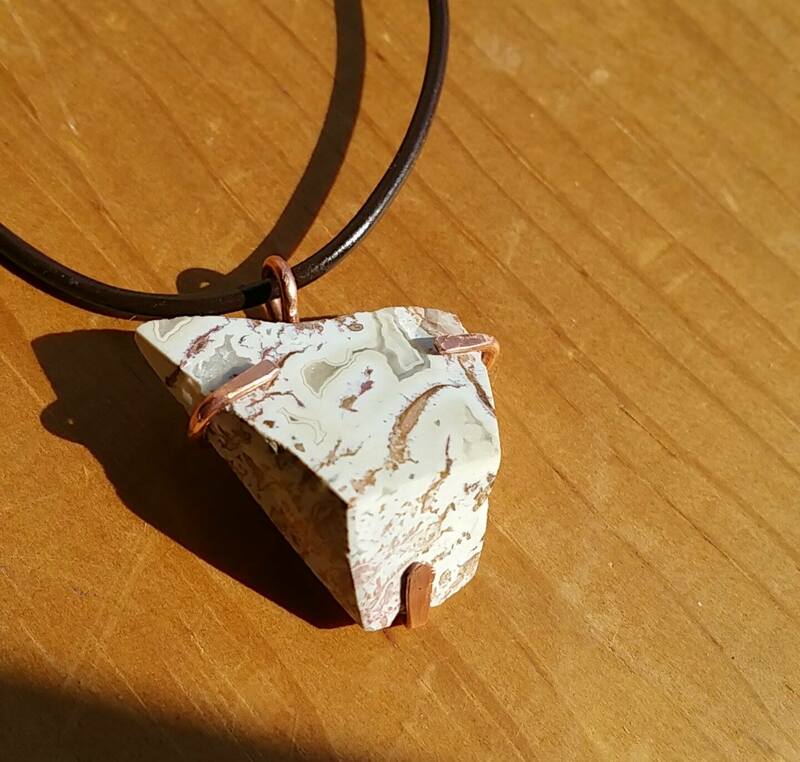 It is now ready to be buffed and polished and made into a stunning pendant! One tumbler load finished today and two more to go before I shut it down for the winter. next week I'll be doing a lot of work on the flat lap and will post more pics and if you are in the neighbourhood, come on by and say hello. Back in The Knitting Business! It was sort of like the tides around here. When Vickie left for Knit City in Vancouver, the yarn went out like the tide and the shelves were totally bare. Then, after a hugely successful show where they sold more than double their objective, Vickie came back and so did a lot of yarn since Lisa had shipped a ton directly to B.C. So, just like the tide coming in, the shelves are once more filled and we also have a fair bit of knitted goods in stock. We also took the occasion to do a little remodeling so here is what we look like now. 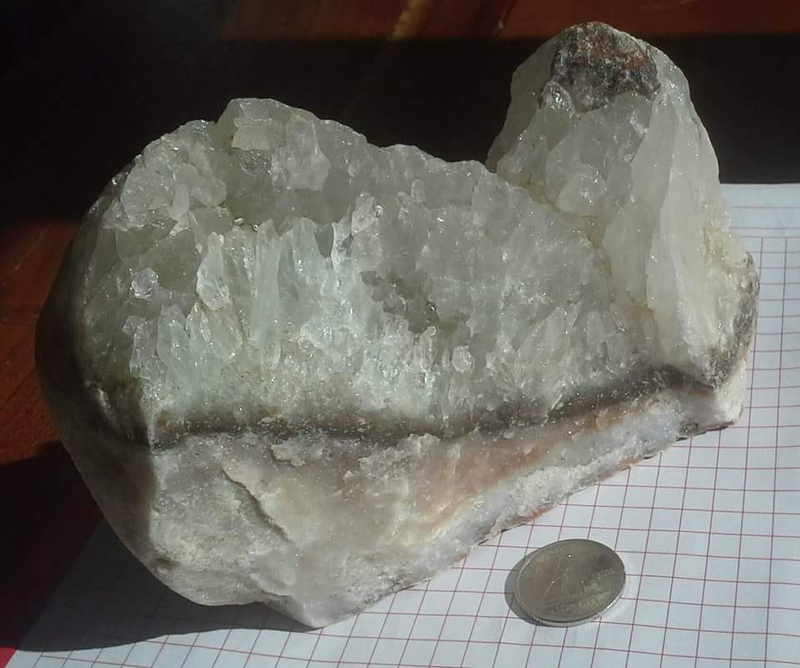 And here is a really nice piece of quartz which I'll probably sell as a specimen. As usual, fall has brought spectacular weather. We hope to have the shop open, at least on weekends, until the end of the year so if you are coming this way, let us know so we can be open for you. How Can I Make My Rocks Look Beautiful? 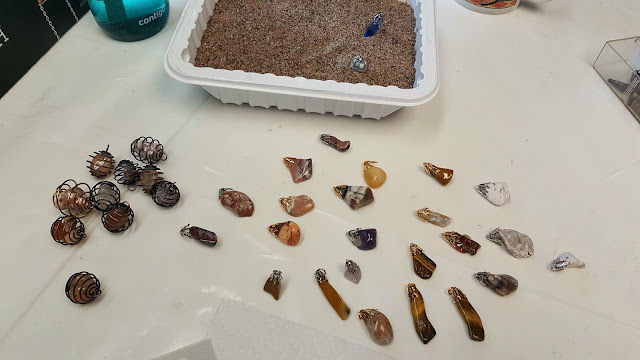 I am a member of the Nova Scotia Rockhounds Facebook group and this morning someone asked about cutting and polishing rocks. I gave the short answer then and will give the long answer now. 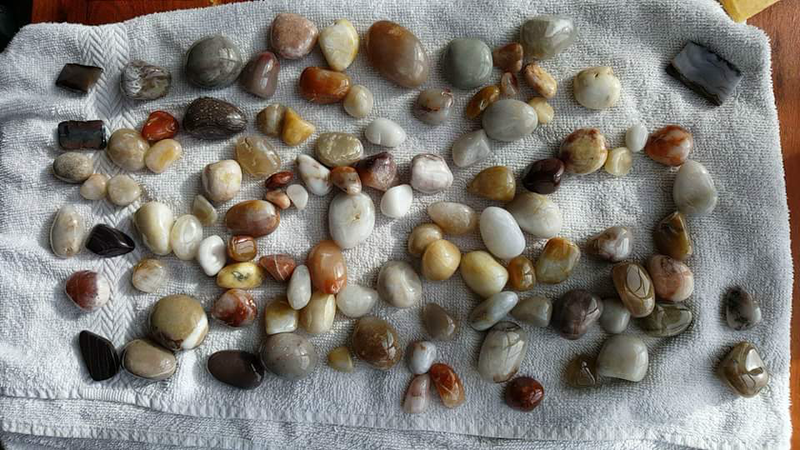 "How can I get my rocks to look as beautiful as yours?" That's a question I often get asked by visitors to my shop. The sad answer is that you probably can't- not because I'm better than you but because I probably have better equipment. 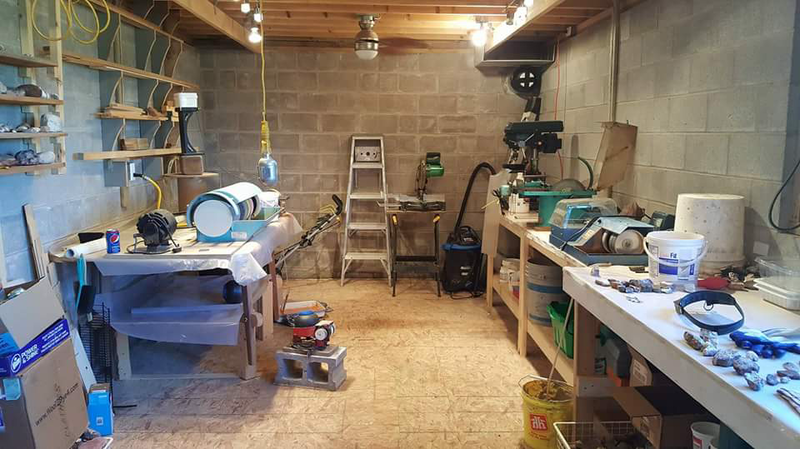 To duplicate my shop with new machines would set you back over $10,000! So it is rare that Lapidary is a money making hobby. That being said, there are some things you can do to make your finds more beautiful- especially if you stay small, and you can at least get started for a reasonable outlay. The smallest saw I own is a Rock Rascal with a 6 inch diamond blade. With it, I can cut rock up to about 2 inches thick. I can also grind a face if I want. But you don't need a rock saw to cut rock. You can get by in most cases with a tile saw. 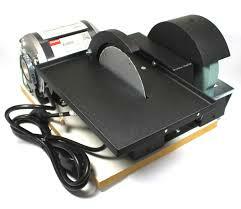 Home Depot has a beauty- the QEP 22650 which you can buy with a 7 inch diamond blade for $129. I've seen it in action and was pretty impressed. This saw has a bridge to help position the rock and can cut faces on an angle if you want. 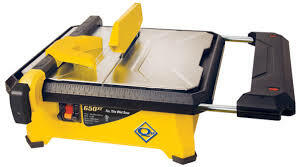 Is the tile saw as good as the Rock Rascal? It depends on the blade you use. It has a 3/4 HP motor so it has the power you need. So now you've cut a face but it has ugly blade marks on it and isn't shiny. No problem. Buy a rock tumbler! But not just any tumbler. There are two basic types of rock tumblers- those which have drums that rotate and those that have drums that vibrate. The rotating type tends to make the rocks round, which is a problem when tumbling vein rock like agate or jasper and they take a long time- several weeks! 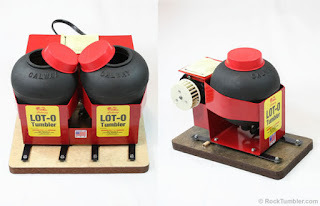 I recently started using a vibrating tumbler called the Lot-O-Tumbler. It has a rubber bowl so it is much less noisy and you can tumble 4 pounds (8 if you buy the double) from rough to finished in less than a week! If you are in Nova Scotia, you may be able to get one from George Johnston who has set up a supply business called Scotia Prospecting Supplies in Chester and if you buy one, get an extra bowl for the polishing stage to avoid grit contamination. Believe me- it is worth it and so is the tumbler! It just might be the best piece of lapidary equipment I've ever used. I give you the Lot-O-Tumbler. 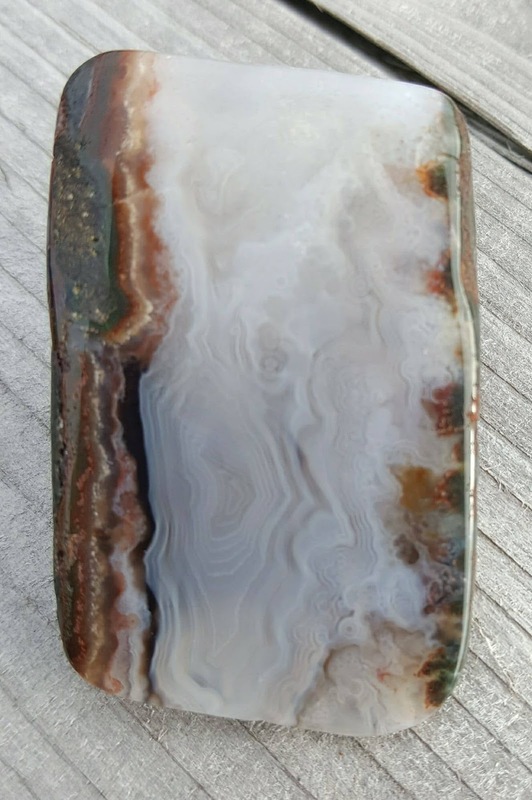 You should be able to put any of your cut rock in here and tumble it to a high shine IF THE ORIGINAL MATERIAL IS A SILICATE or MICROCRYSTALLINE! You can't get a shine on rocks like sandstone (unless there is a lot of silica) or limestone. All you need is some grit and polishing material that George can probably sell you as well. So that's all for this week. next week, I'll do another blog on taking it to the next level. And if you have questions, I'd be happy to try my best to answer them. One last thought. If you have friends who also enjoy the hobby, form a club and pool your money to buy equipment you can share. As a last resort, I charge $30 an hour to work on other people's material.